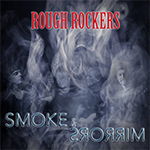 Sweden based rock group Rough Rockers started out in 2012 as a songwriter/recording project by vocalist/bassist Peter Ljungberg and guitarist Magnus Hällström. The band released several EPs in the ensuing years: 'Pimped & Poisoned', 'Overdrive X' and 'A Safe Pair Of hands'. The band also did a number of shows including support for Weapon U.K in Sweden. Early 2018 saw the band secure a permanent line-up with the recruitment of Australian guitarist Joe Matera and Swedish drummer Roger Eriksson. Matera and Ljungberg previously worked together on Matera's 2017 solo single 'Heart Of Stone' which the pair co-wrote. The new Rough Rockers line-up will release a new EP on RVPrecords with Tomas Skogsberg (Hellacopters, Entombed, Backyard Babies). The plan is to follow up by a tour in support of the new album. In the meantime, a new single titled, 'The Rough Rocker' is out and it is the first recording to feature the new line-up.